If you are a fan of the type of review where a game is completely torn down and ridiculed for its short comings, this is not for you. In fact, this will be the complete opposite, a review that will teeter on the very edge of biased fan boy love letter. 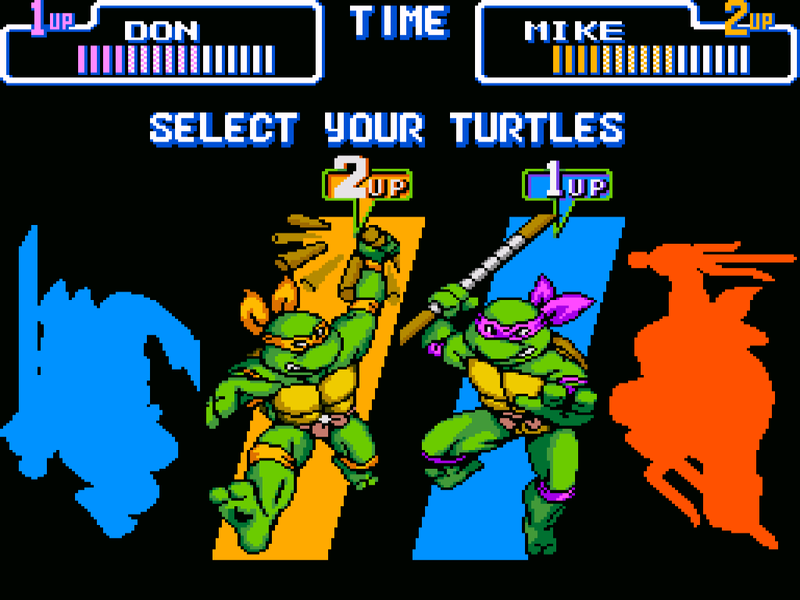 It’s time to look at one of the best arcade style beat em ups of all time on one of the best systems ever, Turtles in Time. There is one notable issue that I would like to begin with and even it is still kind of a stretch, but I will try to be as mean about it as possible. The game, like most beat em ups, lacks entirely in the story department. It is very tough to hold this against it however as it is a symptom of the genre, one plagued with weak stories meant only to drive the gameplay. This gem of the literary arts opens up with a broadcast of April O’Neil who is reporting to us live in front of the Statue of Liberty. 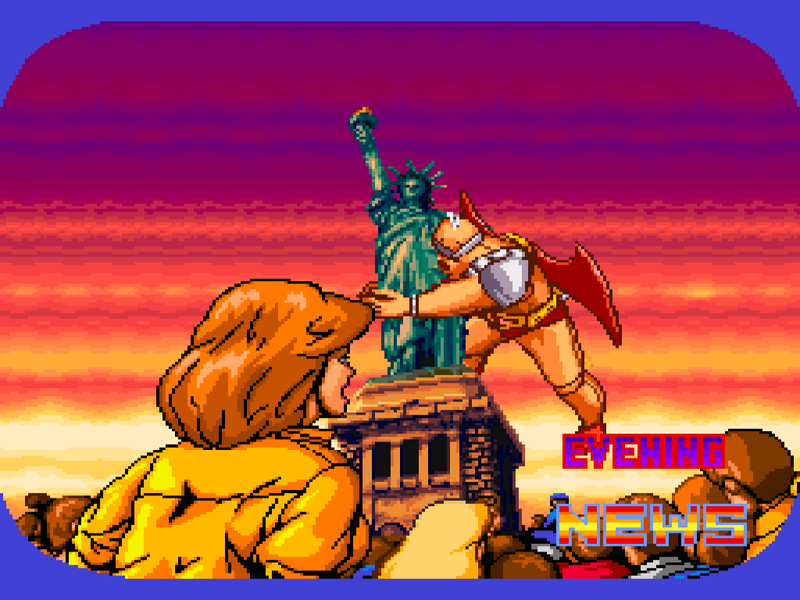 The evil Krang swoops in with his oversized exosuit and steals the entire monument. (Why doesn’t he use this size changing ability to just stomp his enemies?) The broadcast then cuts to an image of The Shredder taunting the turtles to come and fall into his obvious trap…I mean to retrieve the statue. After a few levels there is a huge twist as the turtles fall victims to a trap no one could see coming and are sent through a time warp that results in the remainder of the game being a struggle to get back home. That’s it! To be honest though, that is all the reason you really need to combat an army’s worth of foot soldiers. That’s enough about the story; the real work of art in this game is the combat. Konami subscribed to the mentality of keep it simple and keep it fun. Your only tools against the Shredder and his minions are a jump and an attack button. Sure you can use them in a couple of different combinations for running attacks or dropkicks but from a mechanics stand point there isn’t a lot of variety to the battles. You start off each level with the objective of beating up a ton of enemy fodder until you are confronted with a boss that will have a unique attack pattern. At no point does this end up being a hindrance as combat feels great with spot on controls and sound effects that add a wonderful feeling of weight to each strike. Perhaps I wasn’t being overly truthful, there is one other tool to use in your struggles and it is perhaps the most fun, co-op. 2 players can join up as their favorite turtle (unless they both favor the same one) and dish out the punishment together. Luckily, if your favorite turtle is already being used there is no drawback to using a different one. Unlike a lot of other turtle games the attack range isn’t influenced by the actual weapon, so there is no need to use Donatello if you don’t like him just for the additional reach that a bo staff normally provides…Raphael fans rejoice. It is a little unfortunate that there was no feature implemented to plug in a multi-tap and have a 4 player game going but that’s forgivable as the game provides enough fun for 2 players to top any number of many ‘best of’ co-op lists, Radical! The next in a very long line of great features is the graphics. Sure they aren’t as smooth or crisp as the arcade counterpart but for an SNES game, they are totally tubular. If like me, you watched the original cartoon series, this game will give you nostalgic flashbacks across mediums. The characters all look great and each boss will make you jump out of your seat, point as your screen and say “I remember that guy!” A game like this can very easily feel repetitive, which is why I am so happy to say that the levels fall onto a very wide spectrum of diverse locations (pretty easy to do with a time traveling concept) which helps to combat that feeling of gameplay déjà vu. The turtles will see such times/places as the streets of New York, a space station, a pirate ship and even a prehistoric setting complete with foot soldiers riding on dinosaurs. Come to think of it, if the plan was to send the turtles in time and trap them there, why are there still foot soldiers and guys like Leatherhead or Krang just kind of there? I have made mention of it but I want to address it more completely. Yes, this is a port of a stand up arcade cabinet but it is also so very much more. Players can now come across Roadkill Rodneys and Mousers in various levels which to me are iconic but somehow didn’t make it into the original coin operated unit. A whole new Technodrome level was added which led to the inclusion and rearrangement of some bosses. In total 5 new bosses were added which include Slash, The Rat King, Bebop and Rocksteady and a very unique fight against The Shredder in a battletank. 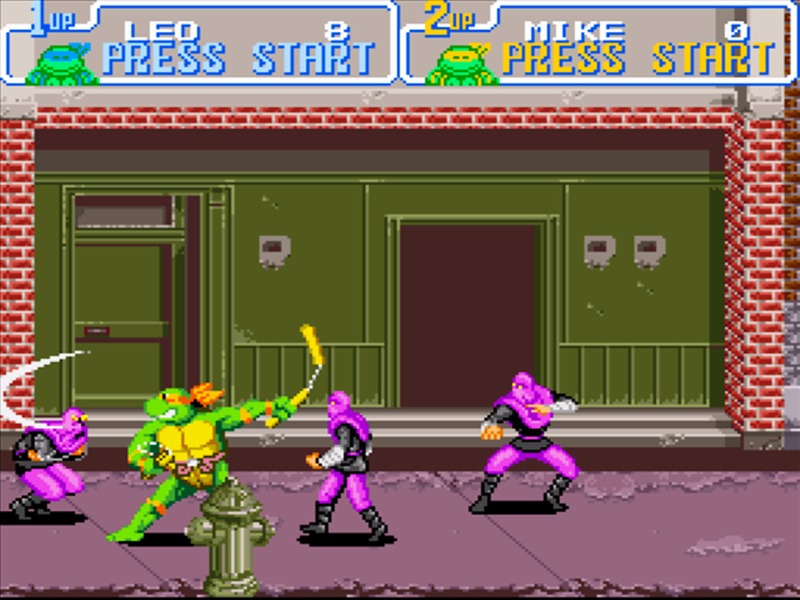 I say very unique because this fight shows The Shredder in a third person view and to do damage to him the turtles must use a grapple attack which launches their enemy towards the screen. On top of all of that they added a time trial and vs mode. These features don’t offer the most depth but they add a bit of a competitive feel and are a welcome addition to an already stellar game. I want to make a note here. This is the definitive version. The arcade cabinet is prettier but does not contain all of the extra content, The “Re-Shelled” version on modern consoles is a remake of that same arcade cabinet, and Hyperstone Heist was at best a consolation prize for Genesis owners. So if you are not playing the SNES version, know that you are missing out. If you haven’t already guessed it, I love this game and can recommend it to anyone. 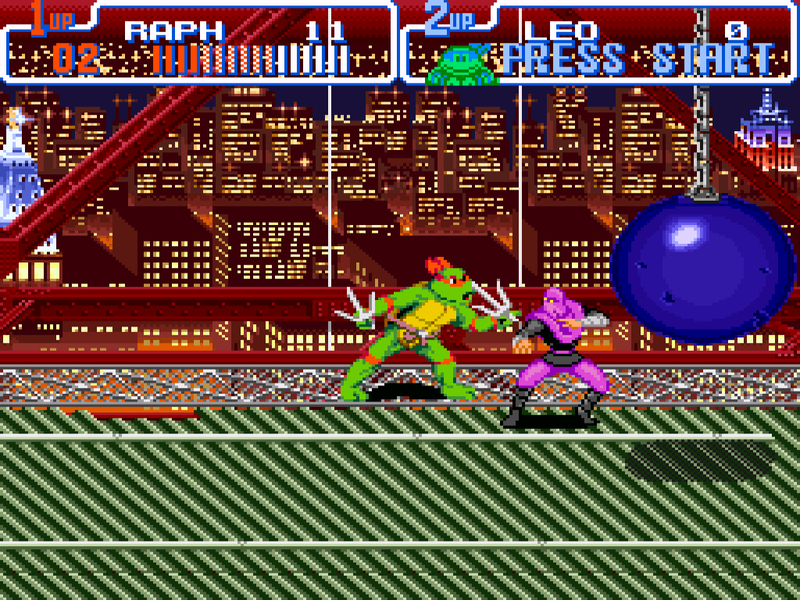 Normally I would say if you like beat em ups, arcade games, or Ninja Turtles you should play it. In this case I would say if you like video games at all, check it out. You will only be the happier you did if you try it co-op with a friend. Since I couldn’t squeeze it anywhere else in the review I guess I will just close with a, Cowabunga Dude! July 12, 2016 in Retro, Review, Sandro Luketic, SNES.